1 large and 1 small mixing bowl. Potato Slices for Tortilla (c) 2007 L. Sierra Licensed to About.com. Cut the peeled potatoes in half lengthwise. Then, with the flat side of the cutting surface, slice the potato into pieces approximately 1/8-inch thick. Make sure to separate the pieces that stick together. It is not necessary to slice the potatoes paper thin and it is best not to use a food processor because most will slice the potatoes too thin. If you slice them a bit thick, don’t worry, it will simply take a bit longer for them to cook. Tortilla Espanola - Onion Slices (c) 2007 L. Sierra Licensed to About.com. Peel and chop the onion into 1/4-inch pieces. Put potatoes and onions into a large mixing bowl and mix together. Salt the mixture to taste. Tortilla Espanola - Fry the Potatoes and Onions (c) 2007 L. Sierra Licensed to About.com. In a large, heavy, non-stick frying pan, heat the olive oil over medium-high heat. Drop a single piece of potato into the oil to ensure it is hot enough to fry. Carefully place the potato and onion mixture into the frying pan, spreading them evenly over the surface. The oil should almost cover the potatoes. Leave the mixture in the pan until the potatoes are cooked. If you can poke a piece of potato with a spatula and it easily breaks in two, your potatoes are done. Remove the vegetables from the pan with a slotted spoon or spatula. Some cooks place the potato and onion mixture in a colander for a few minutes to allow more oil to drain. If you do this, place a plate underneath to catch the olive oil and you can use it again. Tortilla Espanola - Potato-Onion Mixture (c) 2007 L. Sierra Licensed to About.com. While the mixture is draining, crack the eggs into a small mixing bowl and beat by hand with a whisk or fork. Combine the potato-onion mixture with the eggs. Mix together with a large spoon. Tortilla - Cooking in Pan (c) 2007 L. Sierra Licensed to About.com. Pour 1 to 2 tbsp. of olive oil into a small, non-stick frying pan (approximately 9 to 10 inches) and heat on medium heat. When hot enough, stir the potato-onion mixture once more in the bowl and pour into the pan, spreading evenly over pan. You may need to turn heat to medium-low. Allow the egg to cook around the edges. Then, using a spatula, carefully lift up one side of the tortilla to check if the egg has slightly browned. The inside of the mixture should not be completely cooked and the egg will still be runny on top and in middle. Tortilla - Turning with Plate (c) 2007 L. Sierra Licensed to About.com. This is the hardest part of the recipe and the one that makes most cooks nervous. Don’t worry! It’s not as hard as you imagine. If you turn it over the sink, the worst that can happen is that you spill a bit of the egg mixture. When the mixture has browned on the bottom, you are ready to turn it over to cook the other side. Carefully carry the frying pan to a sink. Place a large dinner plate (12-inch) upside down over the frying pan to cover the top. With one hand on the frying pan handle and the other on top of the plate to hold it steady, quickly turn the frying pan over and the omelet will fall onto the plate. You’re almost done! Tortilla - Slide into Pan (c) 2007 L. Sierra Licensed to About.com. Carry the plate with the potato-egg mixture and empty pan back to the stove. Place the frying pan back on the range and put just enough oil to cover the bottom and sides of the pan (approximately 1 1/2 tsp). Let the pan warm for 30 seconds or so on medium to medium-low heat. Carefully slide the tortilla (which is probably still a bit runny), into the frying pan, using a spatula to catch any egg mixture that remains on a plate or tries to run out. Use the spatula to shape the sides of the omelet. Let the omelet cook for three to four minutes. Turn the heat off and let the tortilla sit in the pan for two minutes. Carefully slide the omelet onto a large plate. Tortilla Espanola Ready to Serve (c) 2007 L. Sierra Licensed to About.com. To serve it as a main course, slice it into six to eight pieces like a pie. Serve sliced French bread and a bright salad on the side. To Serve as a tapa, slice a baguette into pieces about 1/2-inch thick. Cut the tortilla into 1 1/2-inch squares and place each piece on top of a slice of bread. The tortilla is simply delicious served with sofrito, a fried tomato sauce that is made all over Spain. It's easy to make; you just have to saute tomatoes, onions, garlic, green peppers, and olive oil in a frying pan. 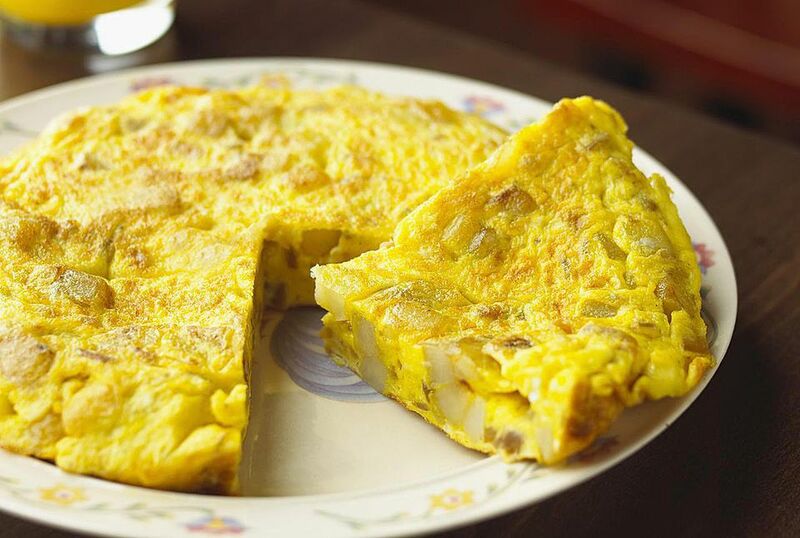 The following are a few of the most popular variations to the classic Spanish omelet. Add 1 green or red bell pepper (chopped) to the potatoes and onions and fry. Slice a Spanish chorizo sausage and add to the potato and onion mixture after frying. Finely chop a couple thick slices (1/4-inch thick) of ham. Then add the pieces to the potato and onion mixture after frying. Canadian bacon or smoked ham that you buy in a deli work well for this variation. Be careful to adjust the salt accordingly, since ham may be salty!